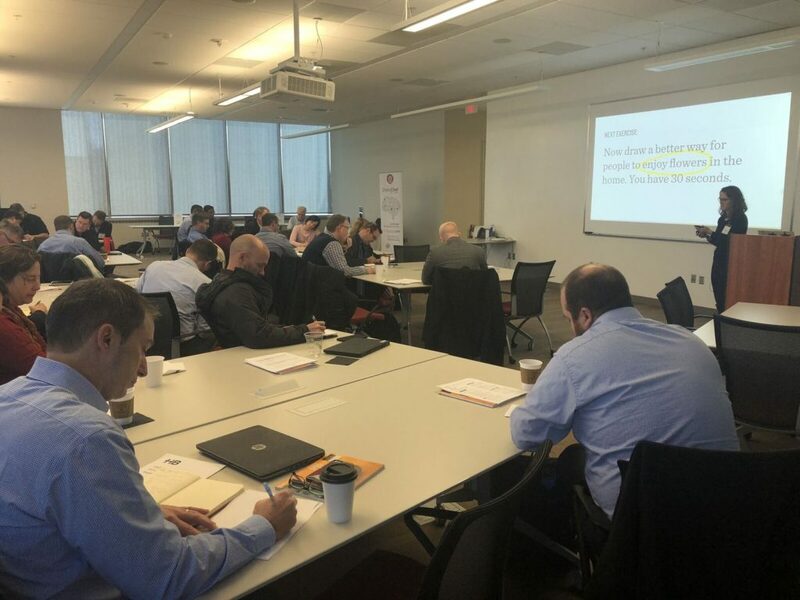 Investors and innovation leaders from the Madison, Wisconsin area gathered on Thursday, November 15th for the Hyper Innovation Summit. 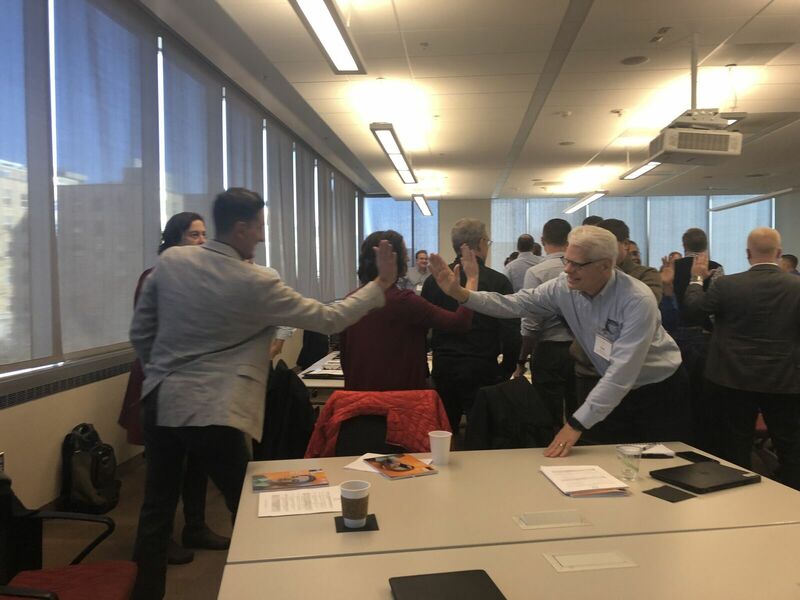 The day was full of networking opportunities, guest speakers, small group discussions led by university thought leaders, startup CEOs and experts, and a “Mini-Expo” for hands-on learning with early-stage entrepreneurs and innovators. One of the session highlights was having Michelle Kwasny, director of UW-Madison’s proposed Master’s degree in Design + Innovation, offer a unique point of view regarding lessons she had to “unlearn” at IDEO. Kwasny focused on three key lessons. The first lesson was about ambiguous problems but not how they’re futile – in fact they’re really important! But getting started making progress toward them is really tough. Design Thinking offers a way to break them down into manageable steps that get to the progress you need. Kwasny began this lesson with a fun exercise: She asked everyone in the room to high five as many people as possible in 30 seconds. This was an easily done illustration for clear directive. A few moments later, Kwasny then asked the room to “make everyone happy” which was a vague request and unexecutable. The lesson was to identify clear problems to solve versus the futility of chasing ambiguous challenges. The analogy to solving business problems was clear and the exercise illustrated a common problem of trying to solve ambiguous problems. Kwasny shared how, at one time, she thought innovation was about coming up with ideas. What she learned was that the idea generation wasn’t the innovative part. The innovation came in choosing the best prompt to identify a key challenge. The takeaway: Choosing a challenge is an act of leadership. Kwasny discussed how it’s not important to just share you work, but is important to share your thought process. Like many, Kwasny was guilty of not wanting other eyes to see her work until it was perfect. Releasing the need to “only show what I am doing when it is done” can lead to new ways to collaborate and sharing the process paves the way for identifying new opportunities and capitalizing on multiple perspectives. Besides Michelle’s presentation, the Hyper Innovation Summit included an array of thought leadership including Disruptive Innovation to drive business, critical data privacy issues, and highlights and insights from initiatives in Connected Health, Transportation and Mobility, and Sports Innovation. Contact sandra@hyperinnovation.com for questions or more details.